Format: 13.5” x 10” x 4"
Center Section 4 inch - designed to carry 13" laptops and tablet computers as well as documents, folders, clipboards, etc. 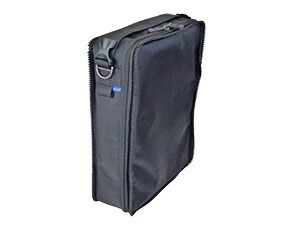 The Center Section Three offers 4 inches of storage and easily carries 13" laptops, some 14" laptops, tablets as well as documents, folders, clipboards, etc. Note - there are no side pocket mounts on the CS4.